Yimiton's Blog: Lagbaja Loses Dad! May his soul rest in peace. Deacon D.A.Olugunde, the father of the masked singer, Bisade Ologunde a.k.a. Lagbaja Omobabamukomuko, is dead. Aged 83, the late Ologunde, a retired civil servant who served in the cabinet of the first military administrator of Kwara State, Col. David Bamigboye, died on Saturday in Ilorin, the Kwara State capital, Northcentral Nigeria. Until his death, the late Ologunde was the Head of Deacons for many years at the Emmanuel Baptist Church, Sabo-Oke, Ilorin. The burial arrangement for the deceased is yet to be announced by Lagbaja. 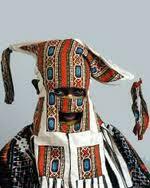 Lagbaja, who is devastated by the tragedy, only confided in some of his close pals the death of his dear father.